With 30 models of amazing amplifier sounds with mind-blowing realism and inspiring expressiveness, a USB audio interface for direct recording using DAW software, and a rhythm machine, looper function and more, G2.1Nu gives you everything you need for live performance, studio session or productive practice. Get premium performance in an all-in-once pedal. Our completely redesigned drive sounds use our most technologically advanced spectral analysis, impulse response and frequency response data, making all the new settings offered on the G2.1Nu the most realistic models we've ever created. There are 20 models of legendary guitar amps and stomp boxes, with accurately fine-tuned sonic aspects like gain setting, range and harmonics character. In addition, you can choose from 10 original sounds created by ZOOM, designed for excellent clarity and presence, capturing your dynamic range adjustments and picking nuances that give you that truly expressive tone that you crave. The G2.1Nu operates as an audio interface, letting you record directly to a computer connected via USB cable. All your sound settings used during rehearsal or a live performance can be recorded onto your DAW software. Its direct monitoring capability eliminates any latency problems, assuring realistic studio conditions and hassle-free operation. Our Edit & Share software is available through a free download and allows you to use your computer to intuitively create, edit and save your own, personalized amp and effect settings. Use our "radar charts" to show a visual representation of the tone characteristics of each preset patch. And amp/effect type sorting helps you quickly find the tone you are after. Using drag and drop to rearrange patches makes editing easy and fun, and you can even download the latest patches online. You can even share your patches with others or download a cool patch someone else created. All 30 drive sounds have a special modeling algorithm designed specifically for line recording. Simply turn on the DIRECT key on the top panel and enjoy dynamic amp sounds that recreate the ideal speaker cabinet characteristics over a flat response audio system or headphones. Of course, this mode works perfectly for direct recording to a DAW application via the USB audio interface. The G2.1Nu features 20 highly creative and versatile patches produced under the supervision of master guitarist Steve Vai. Also included are dozens of presets that authentically recreate the vintage rock sounds of the sixties and seventies, plus the styles of many famous artists. We supply 100 patches right out of the box and you can create your own and save up to 100 more right on the pedal. To recreate the rich blend of harmonics in the upper frequency ranges that are unique to tube amplifiers, you need a powerful, fast processor. Thanks to its high-resolution signal processing using 96 kHz sampling and 24-bit A/D/A conversion, the advanced ZFX-3 sound engine implements complex digital modeling technology to convincingly recreate those subtle tube amp characteristics. One of the most important and useful new additions to the G2.1Nu is its large 1.9 inch display. This new screen makes creating your own sounds a breeze. But we also have simplified the interface with three large control knobs to make changing your tone similar to a stomp box, making the overall operation easy and intuitive. Ranging from standard to advanced, nine modules with 83 high-quality effects provide unsurpassed flexibility and tonal variation. Choose effects like the MXR Dynacomp, famed for its peculiar compression, Vox Crybaby and other renowned wah pedals, four types of chorus with great depth and ambience and six types of reverb providing transparent clarity. Or let your tonal imagination run free with dynamic flangers, tremolo with selectable modulation waveform, harmonized pitch shifter, multi-tap delay, reverse delay and many more. The LCD display and LED indicators make its auto-chromatic tuner easy to use on a dark stage. Its mute tuning capability is also very useful on stage. Choose from 40 different rhythm patterns including 8-beat and 16-beat as well as 4-beat, shuffle and many other variations. The intuitive tap key makes it easy to directly set the tempo. Start a jam session anytime, anywhere. 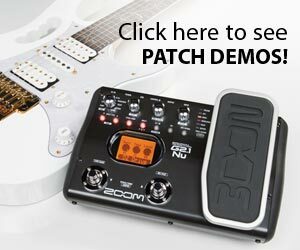 Use its 5 second looper function to record, playback and overdub guitar phrases that can be controlled with your pedal. This ''sound-on-sound'' feature lets you lay down phrases in real time, and during a live solo, you can use the looped sound as backing. Specifications such as a signal-to-noise ratio of 120 dB and noise floor of -100 dBm provide a level of performance that is unsurpassed. Background noise is effectively eliminated, and ZOOM's proprietary ZNR noise reduction also removes unwanted noise. Even the tails of sustained notes come out beautifully, with natural release. With its amazing patch change speed of only 5 milliseconds, the G2.1Nu allows you to never miss a beat. Change from rhythm playing to a solo in an instant by simply pushing the switch and start playing the solo phrase at the same time because the muting interval when switching patches has been reduced to an absolute minimum. The optional foot switch (FS01) allows tap tempo input for rhythm, looper, and effects. Other selectable functions include rhythm pattern start/stop, bank switching, delay input muting, and delay hold on/off switching. You can connect an optional expression pedal (FP02) to control effect parameters such as wah, pitch shift, volume, drive gain, modulation rate, or delay/reverb mix in real time. 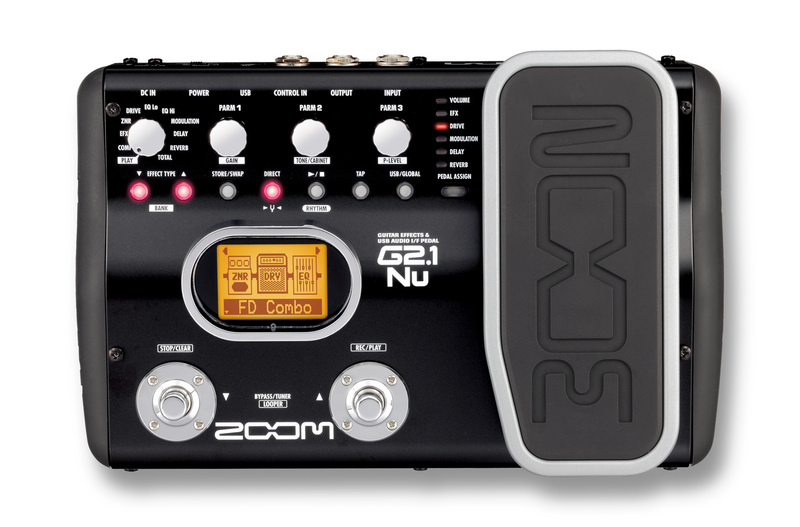 The G2.1Nu has a built-in expression pedal and a dedicated PEDAL ASSIGN key which makes it easy to select the effect you want control on any patch setting. Effect on/off switching is also possible by pushing the pedal fully down. 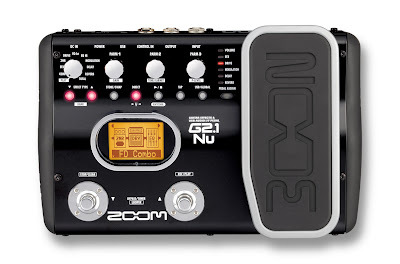 While offering performance and functions far beyond its class, the G2.1Nu has a sturdy metal chassis that can stand up to the rigors of the road, yet, it's still compact enough to fit into the pocket of a guitar case. Wherever you need it: on tour, in the studio, or rehearsals, the G2.1Nu is ready to rock. The G2.1Nu can use three different power sources: AC adaptor, batteries or USB bus power when plugged into your computer. Four AA / LR6 alkaline batteries are good for 6.5 hours of continuous use. Whether in the studio or on stage, the G2.1Nu gives you power options that work.